As a kid, I bought the The DC Annual 1999 Adventures in the DC Universe just because it had so many superheroes on the cover. 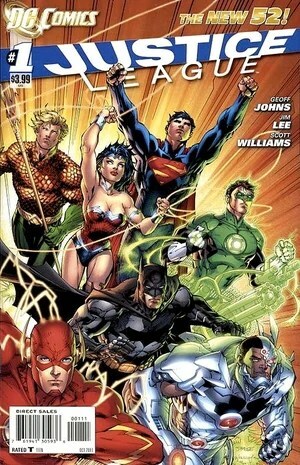 I never knew about the Justice League until I bought that book and read it. It was such an awesome thing to see so many superheroes together in one book, in one story. It was a dream team in the truest sense of the word. That was the beginning of my love affair with Justice League. And I have been fascinated by them ever since. It pips the Avengers anyday for me. The DC relaunch of Justice League rekindled my love affair with Justice League. I can finally read it from the beginning. Well, sort of. Legends like Geoff Johns, Jim Lee and Scott Williams at the helm, I was sure this series was going to be the best of the lot in the relaunched universe. And they live upto my expectations. The first issue of Justice League was quite something! I always thought that all the superheroes knew each other in the Justice League. I was surprised to find out on reading that this is not the case in this issue. Superman, Batman and Green Lantern are seen fighting and bickering each other. And that’s not a bad thing. The verbal volleys between Green Lantern and Batman in the beginning and then at the end with Superman was such pure entertainment! Banter aside, the issue is full of action. You just cannot put it down. Right from the first page, to the last. It took me 20 minutes to finish the whole thing but that is because of the action. The story moves slow. 5 minutes were spent looking at the beautifully drawn panels by Jim Lee. He was made for this title. The story is based 5 years in the past of the present DC Universe. When superheroes, like mafia bosses, operated in their own territories and did not know each other and did not trust each other. Jim Lee’s style is doing things in large and wide panels. Plus, the expressions are top notch. I really love Superman’s new look. Batman and Green Lantern look nice too. They touch up on Cyborg too. All in all, a great book. Its fun to read this. And it certainly entertained me. It made me feel like a kid again. And just for that, I can guarantee you that new readers will truly love this. 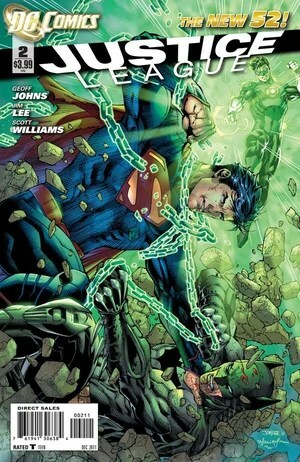 Issue 2 continues the banter and this time its Superman, Green Lantern, The Flash and Batman all together. The team is coming together but one at a time. And since they don’t trust each other, its all the more fun. Splashes, double page spreads, Tall and wide panels, its all here and its all done beautifully yet again by Jim Lee. Geoff Johns made sure that the story moves a bit faster than the 1st book. The banter between our heroes is cocky and all have massive egos. All this makes it thoroughly enjoyable. I think that the story will slowly unfold and it will take time for it to reach the peak level where we see the good vs bad battles between the Justice League and the villains. Lets hope it happens soon because the wait between the issues is just too damn long!